The Beer and Savoury gift selection features two award-winning beers - refreshing Arran Blonde Craft Beer with a crisp fruitiness and hand-crafted Orkney Brewery Dark Island Ale known for its smooth, full-bodied malt character. Serve with classic Isle of Arran cheddar with an apple chutney on Walkers Oatcakes and salted crisps and pistachios or with Baxter’s Royal Game soup. Follow with a Scottish After Dinner Coffee. Scroll down for a complete list of the Scottish food and drink within this hamper. 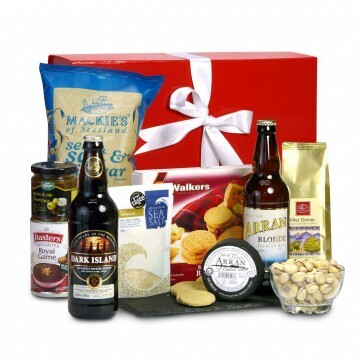 The Beer and Savoury Gift Selection is carefully packed by hand in a gorgeous gift box with hand-tied bow. Remember, please tell us what you’d like written on the personalised gift card included inside.